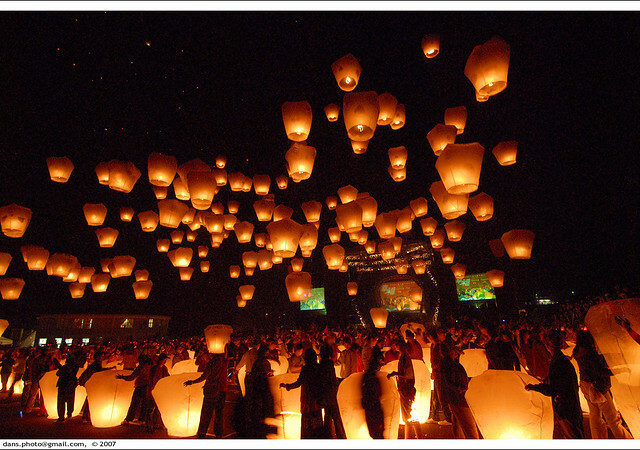 Sky Lanterns Festival in Pingsi 2007 平溪天燈節 | Flickr - Photo Sharing! more than 200 large sky lanterns were released simultaneously, this photo is taken with double exposure. Sky lanterns are traditionally lanterns made of oiled paper with a bamboo frame that contain a small candle or other combustible material (such as the fake prayer's paper money). When lit the candle heats the air and causes the lantern to rise into the air. Ideally the lantern floats back to the ground when the fuel for the flame is exhausted. "In order to appeal for Heaven's blessings following the 921 earthquake, the Taipei County Government specially commisioned a huge heavenly lantern sixty-seven meters in height and weighing two hunderd kilograms for the 2000 Pingsi Heavenly Lantern Festival." Since then, the Sky Lanterns Festival becomes a very special day in Taipei County's Pingsi Twonship. to view all my photos about sky lanterns festival 平溪天燈. Shihfen scenic area, Pingsi town, Taipei County, Taiwan. theshanghaieye, JBF mx, and 80 other people added this photo to their favorites. however, it need the username and password. i am in free Taiwan now. Fantastic! More likely, we have supplied those lanterns. wish you have good business too! Sky Lanterns Republic... How did you supply the Lanterns in the photo above when you only started trading in December 2009 year? I think someone's trying to spam this site to get some more orders?? ?